From the most technologically advanced equipment and thorough eye examination to the most diverse selection of eye wear, we strive to provide the most complete and professional healthcare possible to our patients. Contact lens services, eyeglasses and sunglasses, and detection and treatment of eye disease are just some of the many services we provide patients. Call us today to schedule an appointment and be on the road to a clearer future. 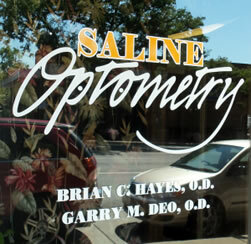 Contact Saline Optometry today at 734-429-9454 or browse the website for more information about our eyeglasses and contacts or shop in our online store.